Jamia Millia Islamia B.Tech BArch Admission 2019 through JEE Main - Jamia Millia Islamia (JMI), New Delhi invites applications from candidates for Admission to B.Tech/ B.Arch Programs for the academic session 2019-20. 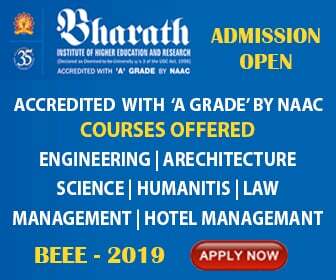 Admission to B.Tech. & B.Arch. Programs of Jamia Millia Islamia for the session 2019-20 will be based on the Final Rank of JEE Main-2019 Examination conducted by National Test Agency (NTA). Candidate appeared in either or both the JEE Main 2019 exam may apply. No candidate shall be admitted to architecture course unless she/he has passed an examination at the end of the 10+2 scheme of exam with at least 50% aggregate marks in Physics, Chemistry and Mathematics and also at least 50% marks in aggregate of the 10+2 level examination or passed 10+3 diploma examination with Mathematics as compulsory subject with at least 50% marks in aggregate. The seats for admission to B.Tech and B.Arch. Program at JMI will be allotted as per prescribed JMI’s Admission procedure, Applicable Reservation of Seats and MERIT solely determined by the score in JEE (Main) 2019 Paper 1 and Paper-2 respectively. The candidates appearing in JEE (Main) 2019 and submitting the online admission form of Jamia will only be considered for admission to B.Tech & B.Arch Program.